Yoga is an important part of my life. I have one of the most compassionate and kind teacher in the world!!! I have been studying with Momi for the last 10 years. Momi loves sweet and one of her all time favorite is Kheer (Indian rice pudding). I offered to make a dessert for her women’s yoga retreat in April. I wanted to come up with something vegan. Kheer is usually made with milk. I decide to replace milk with coconut milk, I also change the classic basmati rice to jasmine rice. It was a big hit! It’s also one my most request recipe. Vegan Coconut Kheer (rice pudding) with mango. 1 large ripe mango, peeled, flesh removed and dice. Wash the rice a few times, drain. In a medium pot, boil rice with 2 cups of water till the rice is cooked and thickened. Add coconut milk to the rice mixture. Stir constantly, the pudding will stick at this point. Cook till the rice “flower” and to the thickness of porridge and coating the back of the spoon. Fiddleheads, Morels and ramps, now that’s Spring!! I love vegetable, especially spring vegetable. I guess we have been deprived for freshness for 6 months. The sign of spring is one of those simple pleasures in life. As I wait for my CSA to come in, I am picking up my vegetable from Wedge Coop for the interim. As expect, my favorite spring vegetables are in: fiddleheads, morel and ramps. They are beautiful. 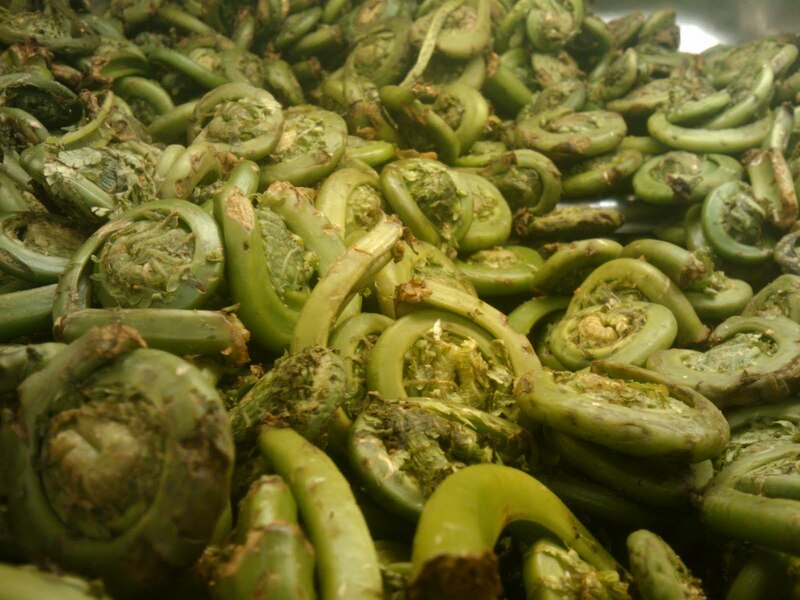 Fiddlehead is one of those “funny” vegetables. Here is the official description of what they are: “Fiddleheads or Fiddlehead greens are the furled fronds of a young fern, harvested for use as a vegetable. Left on the plant, each fiddlehead would unroll into a new frond. As fiddleheads are harvested early in the black season before the frond has opened and reached its full height, they are cut fairly close to the ground.” http://en.wikipedia.org/wiki/Fiddlehead_fern. 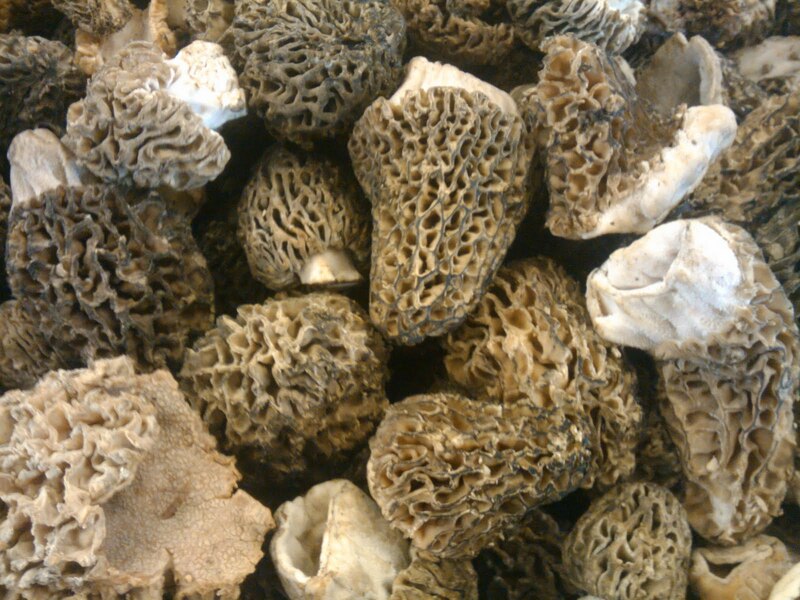 Morels are expensive, but it’s worthy treat. They were $40 a pound today, but you don’t need a lot and they are also light. You can substitute this with crimini mushrooms or other wild mushrooms. I want to preserve the freshness and the earthy taste of these wonderful treat. Here is a very simple one pan vegan dinner for my vegetarian friends. 1 cup cooked rice. I use hapa rice: ½ Japanese short grain white rice, mix with ½ Japanese short grain brown rice. Trim the dark ends from the stems and soak the fiddleheads for about 15 mins. Swirl them around and rub off the thin flaskof chaff on the fern. Drain and raise. 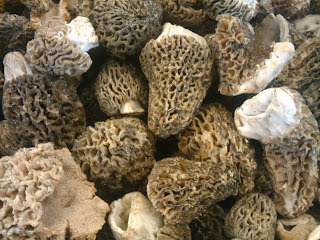 Trim the morel and quarters. Trim and chopped 2 ramps, set aside. In a small saucepan, bring some water to a full bowl, sprinkle with sea salt. Blanch the fiddleheads for the about 5 mins. Drain and raise with coldwater in colander. Set asset. In the same pan, over medium high heat, add remaining 2 tbsp olive oil. I don’t wash the pan, I want that taste of morel to transfer to the rice. Saute ramp till lightly browned. Season with salt and pepper. Add rice. Fry till heated thoroughly. Season with salt. Add a dash of sesame oil. In a small ramekin, pack fried rice tightly. Invert rice onto your serving plate on one side and spoon the fiddlehead and morel sauté on the other. Sprinkle with ready-made fried onion. This is one my favorite product that adds texture and flavor. Dinner for 2 is served! !